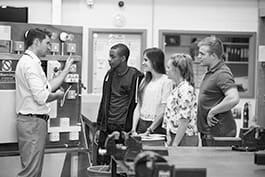 Vocational education teachers teach or instruct subjects at in vocational education. Prepare course programs, course materials, exams etc. Prepare meetings with students (e.g. lectures, demonstrations, seminars, laboratory sessions). Determine training needs of students and adjust the approach accordingly. Guide on-the-job training, training sessions and internships. Instruct students individually and in groups, using various teaching methods (e.g. lectures, discussions, demonstrations, supervised practices). Establish and enforce rules of behaviour and procedures for maintaining order among the students. Grade students' work, such as exams, assignments and papers. Evaluate and report on student' performance and behavior. Keep abreast of developments in their field, e.g. by reading current literature, talking with colleagues and participating in professional conferences. Confer with work organizations to establish internships. Evaluate and, if necessary, revise curricula, course content, course materials, methods of instruction, etc.